I'm just about to wrap up my vacation here in Atlanta, GA! We also managed to squeeze in a few days to beautiful Savannah. I fell in love with 'her' and not just because Paula Dean calls Savannah home. No chance of visiting her restaurant this time, but we did get a quick snap shot of her eatery. We've got some packing to do before we hit the road and head back to NC. I'm not looking forward to the smokey skies back home as we've been battling a terrible wild fire that is projected to smolder all Summer! I would rather take the Atlanta smog over smokey air any day. 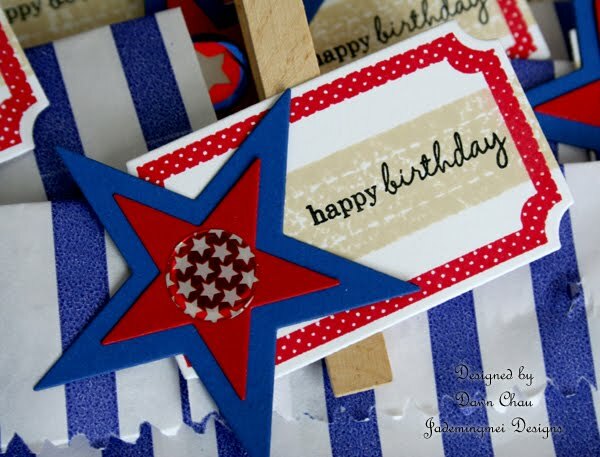 Anyhoo, just a quick post on a birthday celebration we threw here this weekend for the July birthdays. My bro-in-law was born on the 4th, niece Kate is on the 8th, and my baby girl, Addy, on the 18th. If you've been following my recent posts, this is another identical banner to a previous one posted. I made a duplicate for my sister to hang on her fireplace hearth and to use for the party. 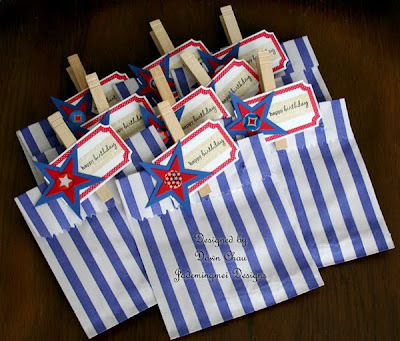 Love these striped bags for party favors! We decided to put 4th of July themed cookies on the inside. The fit and worked perfect! All stamps and rectangle die are from Papertrey Ink. The small metallic stickers on the stars are from a Michael's sticker pack. The finished tag is attached to a close pin to 'seal' the bag. Once I'm home and settled, I will have some fun posts with 'my little firecracker' stamp set. I've already posted a sneak peek on my FB page if you'd like to check her out...fun lil' gal! 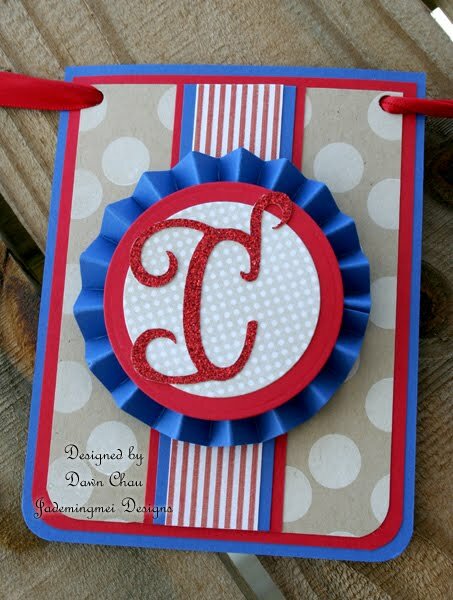 Happy 4th to you and yours!